1. Target audience and primary objectives: The first step is concerned with identification of your target audience and determination of your primary objectives for the mobile learning course. Target audience is the people who will actually be accessing the information you provide. Remember that usually the target audience for a mobile learning course is people who are pressed for time. It is highly likely that a person chooses a mobile training course because he wants to access the learning management system (LMS) from anywhere at any time. This would mean that the course content you design should only include information that is highly essential and can be comprehended in less time. Therefore, you will have to stick to relevant and concise course content rather than comprehensive and long. 2. Course distribution choices: The second step deals with determining how your mobile learning course is going to be distributed. 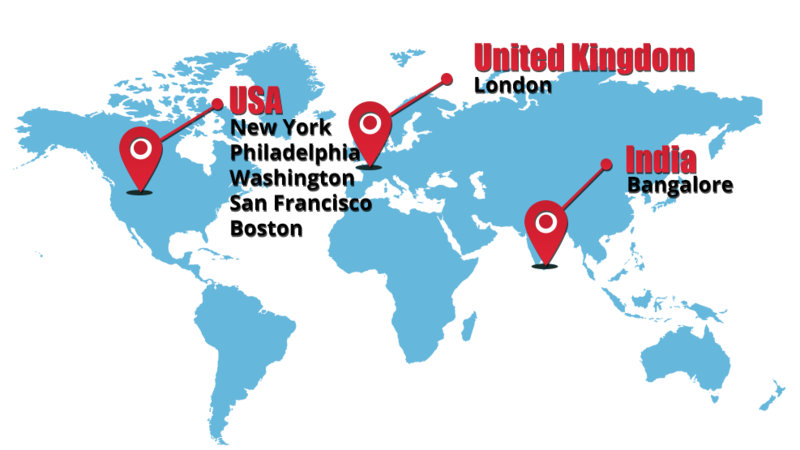 You may be planning to make your content available for all mobile platforms or could be either one or two popular ones such as iOS and Android. In the ideal scenario, mobile learning course will be distributed in all platforms and all devices but practically this can be very difficult because this would involve tailoring your content as well as the graphics in it to mobile devices with different screen sizes, resolutions and other specifications. However, your course distribution choice should depend on factors like your target audience, subject matter and the content itself. 3. Security: Security is an important aspect of every mobile learning program. You have to make sure that your mobile learning platform has enough security measures including encryption and password protection to prevent unauthorized entries and allay other security related concerns. Keep in mind that smartphones are small computers which have the capacity to download information and perform unethical tasks involving retrieval of personal information. Therefore, keep all information encoded or carefully guarded. 4. Social media: Mobile learning is extremely personalized and asynchronous as it involves each learner taking his time for learning and adopting a program or plan that suits him best. Mobile learning typically doesn’t involve any group activity or teamwork and learning takes place at an individual level. However, it is highly beneficial to integrate social learning strategies into your mobile learning platform. This means that with the help of social media you will be able to transform your mobile learning experience into an interactive as well as engaging social learning experience. Social networks, collaborative learning tools and group activities help to bring social learning elements in your mobile learning program. 5. Testing: Testing is the last step that precedes the official launch of your mobile learning course. Testing lets you identify technical errors or bugs and glitches that you overlooked. Quality control is a term used to refer to the assessment or evaluation of performance of developed work or product. Quality control is done to ensure that your mobile learning course works well in all platforms and devices you intended for it to work on. Testing is usually followed by revision where the errors that were identified are rectified. Next step is launching but that is not the end of mobile learning strategy. 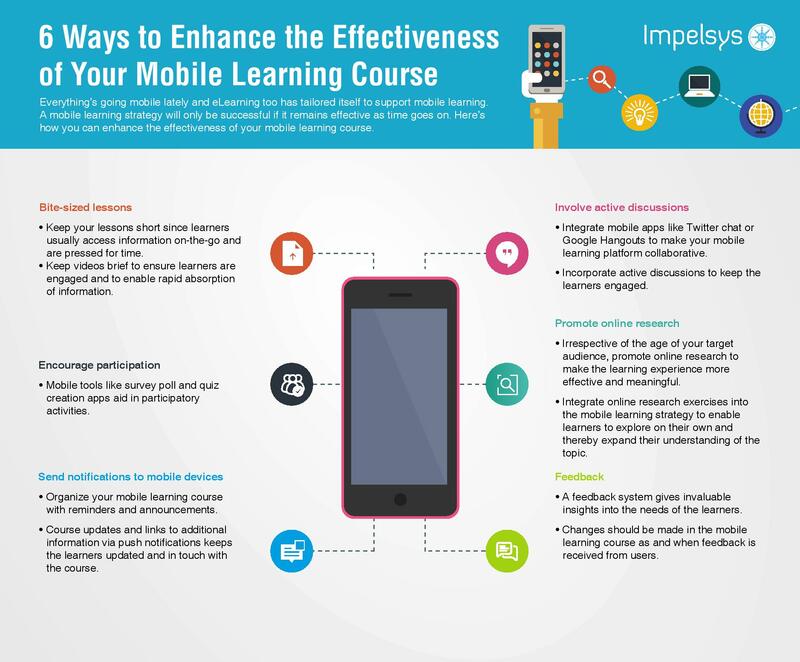 An effective mobile learning strategy always involves continual assessment of the effectiveness of the mobile learning course and strategy. Therefore, mobile learning strategy can be seen as a never ending strategy or a work always in progress. Once you launch the finished product in the market, you need to continuously assess the performance of your mobile learning platform especially by getting feedback from the actual users through surveys and other methods. A mobile learning strategy will only be successful if it remains effective as time goes on. That is why it needs to be constantly evaluated and subsequently improved upon. Furthermore, ensure that the assessment system of your mobile learning platform is useful. The goal of assessment is not to ascertain that the learners are getting good scores. A good assessment system will let you know whether the audience understands what is being taught to them. If the learners cannot grasp the concepts clearly then the whole learning process is a waste of time. That is why the assessment system should measure how much the learners have understood. This involves asking interesting and thought provoking questions that engage the learners. Too much theory and long questions will only scare the learners away. 1. Bite-sized lessons: Since the learners are using mobile devices and are also pressed for time, keep your lessons small. The learners usually access information on-the-go and prefer lessons that are brief and to the point. If you are thinking of creating videos, keep it brief i.e. in the range of 2-4 minutes. Brief videos provide information in a convenient form which keeps learners engaged and also enables rapid absorption of information. Since your target audience will be accessing information from a variety of places, it is better to keep audio narration to a minimum. 2. Involve active discussions: Mobile learning experience is complete only when there is an opportunity to effectively communicate and collaborate with peers. Also, the learners should have the opportunity to interact with their instructors and receive support from their part. To make your mobile learning platform collaborative in nature, you can integrate mobile apps like Twitter chat or Google Hangouts to allow learners to interact with each other. Active discussions can keep the learners engaged in the learning process; it also provides enough motivation for them to continue wherever they find themselves in a tough situation. Discussions allow learners to share their experience and explore ideas at length. This gives every member of your learning program an opportunity to voice their views and opinions to fellow-learners without any need of the physical classroom setting. 3. Encourage participation: Give the learners an opportunity to apply their learning. For example, let the learners become instructors once they gain enough information. This not only gives them a unique experience but also helps in effective retention of information they already learnt. Give the learners an opportunity to explore the subject matter on their own and put the main ideas in their own words. Various mobile tools like survey poll and quiz creation apps aid in participatory activities. 4. Promote online research: Irrespective of the age of your target audience, promoting online research will only make the learning experience more effective and meaningful. When you integrate online research exercises into your mobile learning strategy, the learners will get an opportunity to explore the topic on their own and thereby expand their understanding of the topic. This can be used to supplement the core learning program. 5. Send notifications to their mobile devices: In order to keep your mobile learning course more organized, you can make use of reminders and announcements. These could include course updates and even links to additional information via push notifications on the mobile phones of the learners. This method helps to keep the learners updated and in touch with the mobile learning course. An important point to remember is that every mobile learning course should evolve along with the needs of the users and the technological advancements and trends in the world in order to be successful. A stagnant mobile learning course will never remain effective even if the best strategies were applied to develop it. Dynamism is an important element of every mobile learning course. That is why a feedback system is a must for a mobile learning course. Feedback gives invaluable insights into the needs of the learners and what changes needs to be made in the mobile learning course if it has to overcome the challenges faced by the learners. Getting invaluable feedback also is not sufficient. Changes should be made in the mobile learning course as and when feedback is received from users by consulting eLearning professionals. Only if the changes are made will the feedback be useful. Now you have learnt how to develop a mobile learning strategy and also how to enhance the effectiveness of your mobile learning course. Applying these guidelines and integrating your mobile learning platform with the methods mentioned in this article will help make your mobile learning course a truly memorable one for your target audience.